New Zealand Scholarships 2017 are prestigious scholarships for people from developing countries to study in New Zealand and the Pacific. Our scholarships foster and build potential leaders, as well as equipping individuals with skills and knowledge to benefit their home country. You’ll study with students and lecturers from around the world, and build life-long connections to New Zealand and a global network of leaders and high achievers. We accept applications at different times of the year. Check the relevant tertiary application dates and application method for your country. Application dates for all Commonwealth scholarships are to be confirmed. TIP: Get your application in a few days before the closing time. The online application portal is put under heavy stress during the last few days with thousands of applications. Err on the safe side and get your application in at least 3-7 days ahead, in case there are any technical problems. We accept no responsibility for technical problems with the Online Application Portal. Application deadline is in New Zealand Time. Note: Applications close at midday (NZ Time), not midnight. 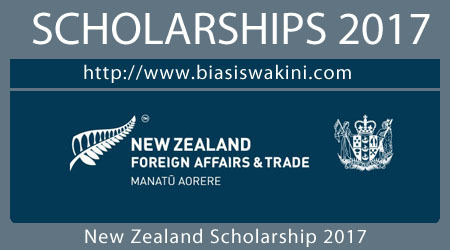 0 Komentar untuk "New Zealand Scholarship 2017"